Lenticular or wave? Both terms are used. 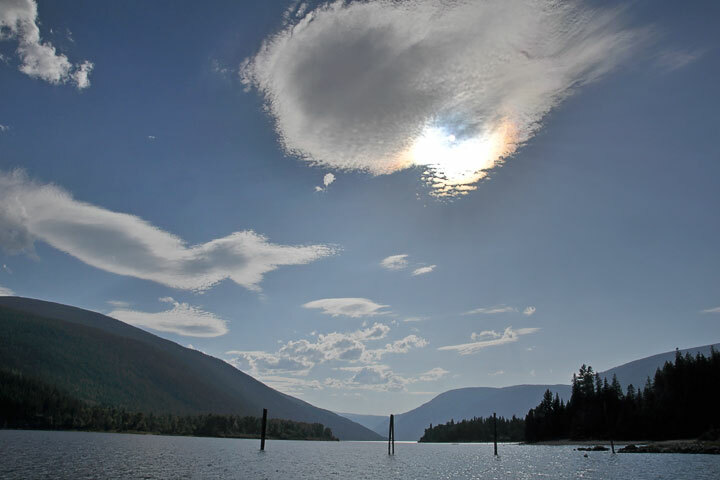 The late–nineteenth–century term is lenticular, a term which likened the cloud shape to that of the lentil seed (after which the optical lens is also named). Although people associated these clouds with mountains, they did not understand the connection. 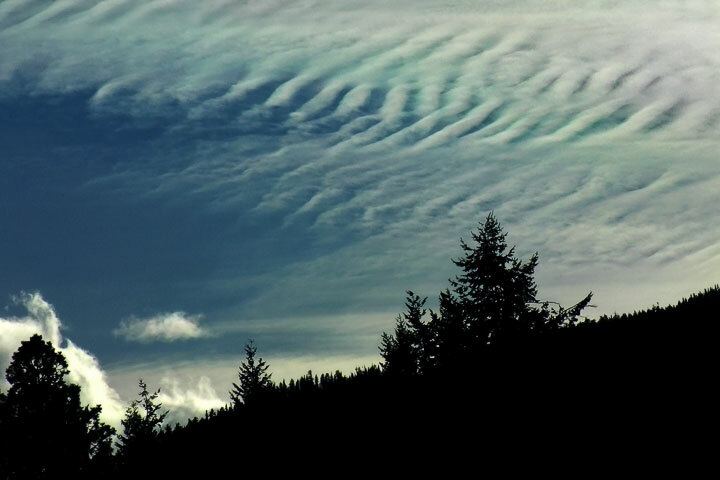 By the mid–twentieth–century both theory and observation showed these clouds to result from gravity waves in the lee of mountains—thus the term, wave or mountain wave, characterizing the underlying airflow. 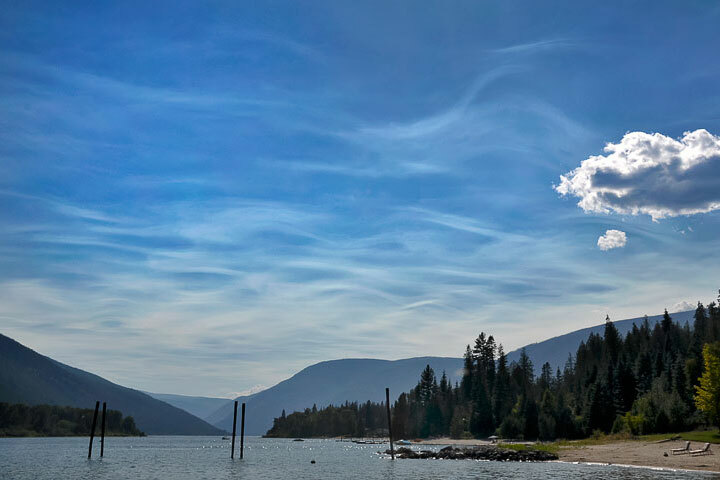 Wave clouds seem to float in place over the mountains and the Lake—but they owe their origin to strong winds over the mountains. Imagine an isolated rock with the waters of a creek flowing over it. The water is forced up over the rock and as it plunges down the backside, it oscillates up and down giving a train of waves. The same is true of a boat moving over the surface of the water, but this time the boat is moving (not the water) and the water is forced down by the boat. Again, as the water recovers, it oscillates leaving a train of waves behind the boat. These situations are mimicked by the atmosphere when there is a wind against a mountain. First the air flows up and over a mountain, then down the lee side where it begins to oscillate vertically to give a downstream train of waves. The clouds, known variously as wave clouds or lenticular clouds form at the crest of the waves. Stability is a general term to describe how something initially in equilibrium (balance) reacts to a disturbance. If it returns to its original position (although possibly overshooting and oscillating) it is stable. If it accelerates away, it is unstable. Although there are many meteorological processes for which stability is an issue, the important one for mountain waves depends upon the vertical variation of atmospheric temperature and moisture. The accompanying text merely describes the atmosphere (or portion of it) as being stable or unstable without treating the matter further. Mountains and wind abound, so why aren’t wave clouds more common? One answer is that there might be mountain waves without the clouds if the air is particularly dry. Yet, in most cases, the answer is that the waves themselves are absent. For the waves to form and extend downstream, the atmosphere must be (statically) stable (even in the presence of clouds), and the wind must increase with height—a combination more stringent than merely having wind. It is most likely in the winter (although stratus may block the view from the valleys) and with the approach of large storms. Other delightful characteristics of wave clouds are discussed in the captions, below. 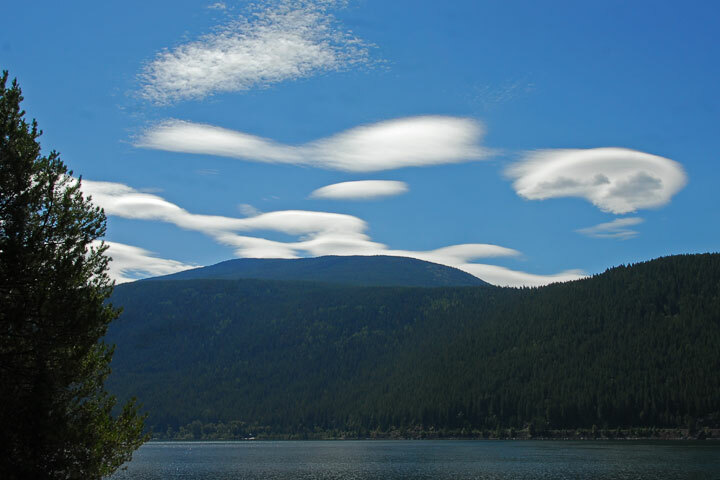 Wave clouds, smooth, rounded, lenticular–shaped clouds, hang over the mountains of the south Selkirks. Most clouds drift in the wind, but not these. They sit on the crests of waves in the airflow caused by the mountains, and as the waves are more or less fixed in position, these clouds hold their positions even as the air passes through them. Diagram Just as water flowing over a rock in a stream produces waves, air flowing smoothy over a mountain can produce a series of lee waves, if the atmosphere is stable. Where the air ascends, vapour cools and a cloud can result; where it descends, vapour warms and the cloud evaporates. The result is a series of smooth wave clouds, at (more or less) the same height. 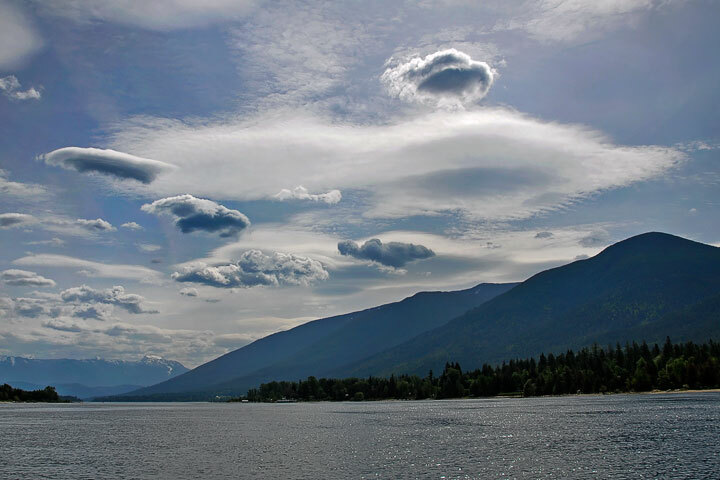 Seen obliquely, these clouds often appear lenticular. Notice that the cap cloud (over mountain top) is distinctly asymmetric: lee side is steeper. Even when mountain waves are present, they may not be seen if there is insufficient moisture for wave clouds to form. Yet, occasionally the smoke from a distant forest fire serves as a tracer. The smoke must be confined to a shallow layer or the undulations will not be apparent. Cap cloud A cap cloud sits on the crest of the mountain (as distinct from the wave clouds downstream). 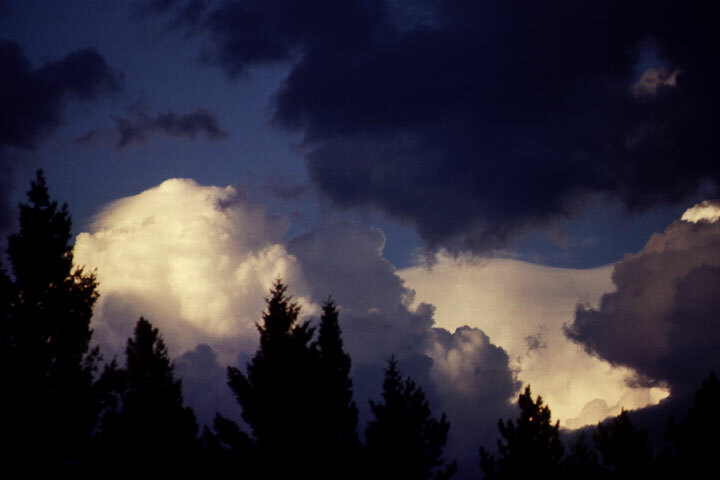 This cap cloud is over a ridge about 3 km southeast of Ymir Mountain. The wind is from right to left (the reverse of the diagram, above); the tail of the cloud extends upstream and the steep side of the cloud is on the lee side. Wave clouds over the Purcells at sunrise. A wave cloud is easy to associate with an isolated mountain, but, in our sea of mountains, the problems is as difficult as associating a specific water wave with a particular boat on regatta day. The silhouetted mountain in the distance is Sphinx. It is often the case that the lowest portions of the atmosphere will be unstable and allow cumulus clouds. While above this, the air is stable and mountain waves can produce wave clouds. With nocturnal cooling of the surface, the atmosphere stabilizes making wave clouds more common in the early morning than later in the day. 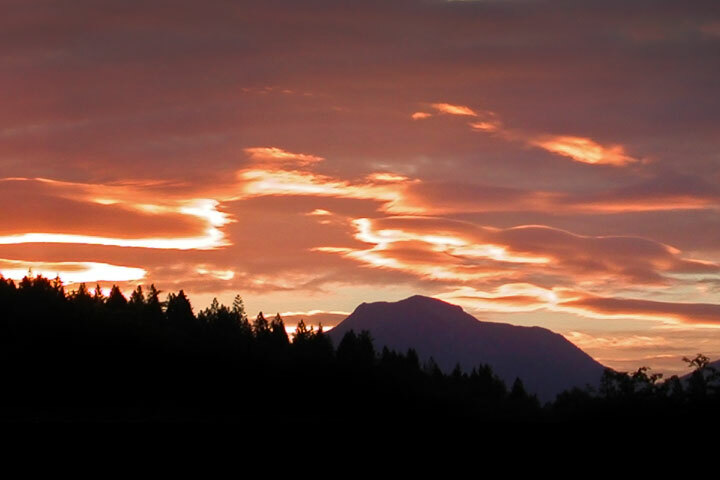 This view, looking south, shows the first rays of the rising sun on wave clouds. 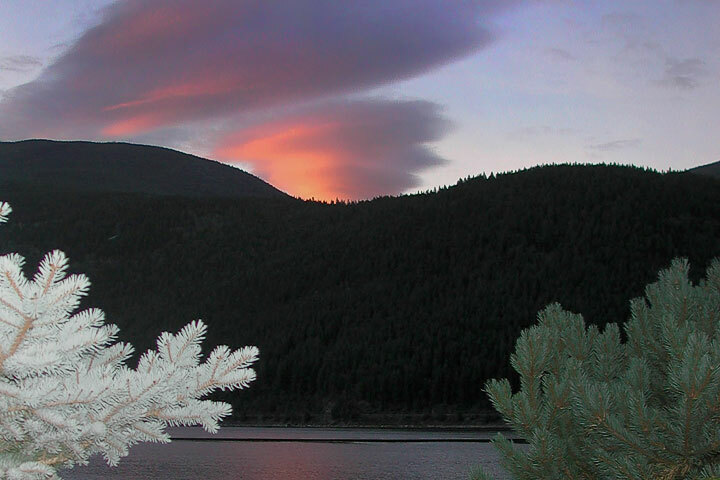 The spruce on the left is displaying the sylvanshine. Unlike most other clouds, wave clouds have a remarkably uniform drop size—all the cloud drops grow together as they form at the entrance region and evapourate together at the exit region. 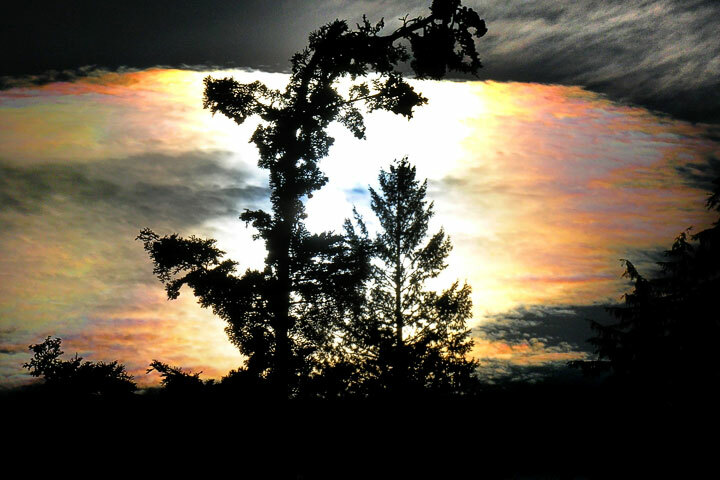 This uniformity leads to nice coronal colours when the cloud is in front of the the Sun. 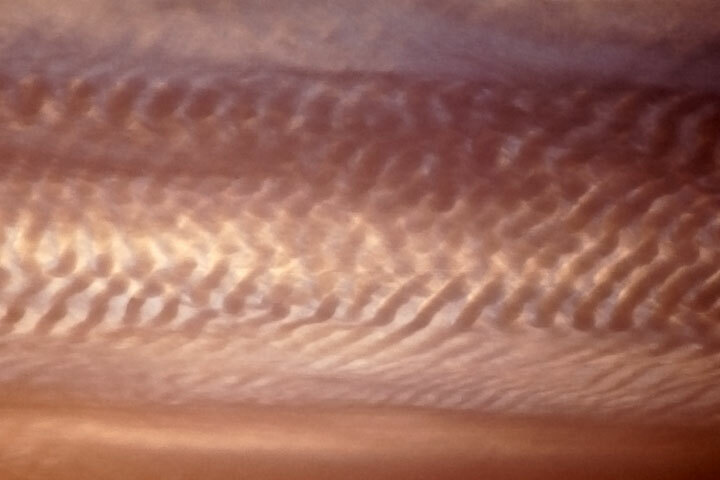 Owing to the uniformity of drop sizes, wave clouds give superb coronae. Billows are beautiful. Yet, they should not be confused with the wave clouds, themselves (as many sources do). Billows, which occur on a much finer scale than wave clouds often appear as a delightful detail upon the larger clouds. This picture shows a portion of one wave cloud which is replete with billows. Billows can grow rather like ripples on a wave cloud; indeed they start with what looks just like breaking waves on the surface of the cloud. 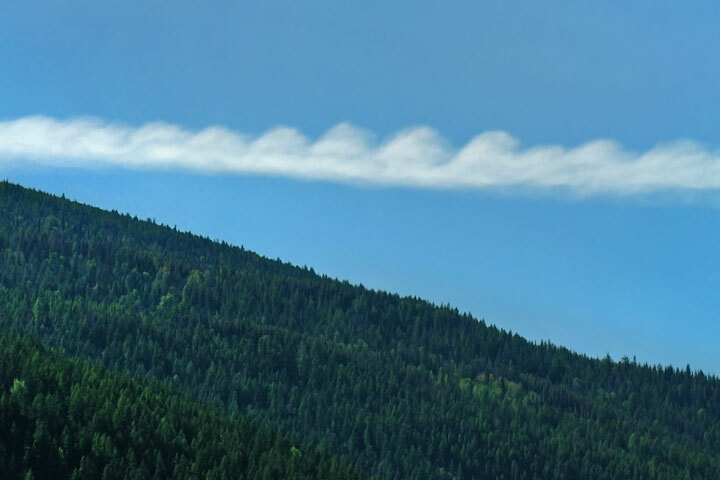 It is a process which arises from something called Kelvin–Helmholtz instability. A wave cloud over the south Selkirks festooned with billows. 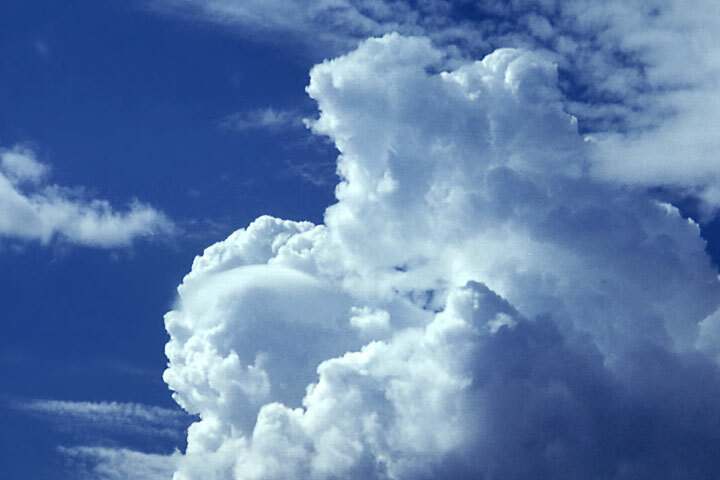 The broad–brimmed hat on the cumulus cloud in the centre of the picture is a Pileus. 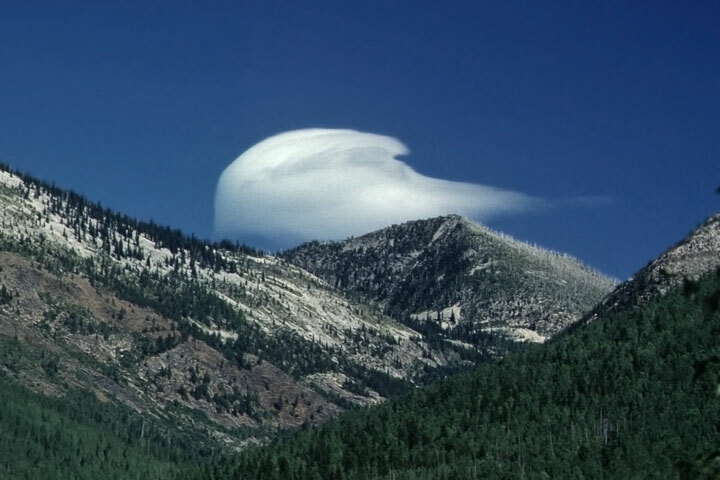 The pileus is a cap cloud, but on a cumulus cloud rather than on a mountain. As a cumulus pushes up into the stronger wind aloft, it serves as barrier to the airflow in the same way as does a mountain. Indeed, when a pileus is seen on a cumulus, other wave clouds are also likely to be seen, as is the case here. There is a little pileus over the small growing tower in the middle left. While the cumulus forces the winds up by presenting a mountain–like barrier, it does more. As the cumulus is growing, this can also lift the air over it. 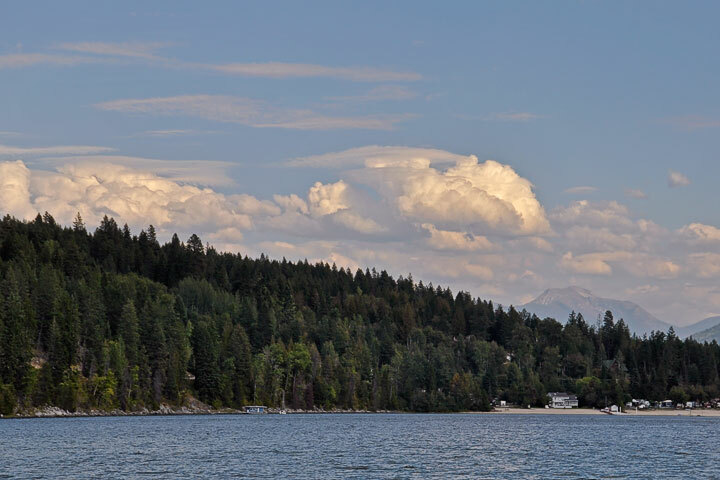 The cumulus clouds in this scene are heavily veiled with pileus. Pileus is Latin for a cap; it is the same word which is used for the cap of a mushroom. Smoking mountain The wind is blowing from left to right across this sharp peak (Mt. Loki). But, unlike the airflow over a smooth mountain, this wind flows right across the top rather than descending on lee side. 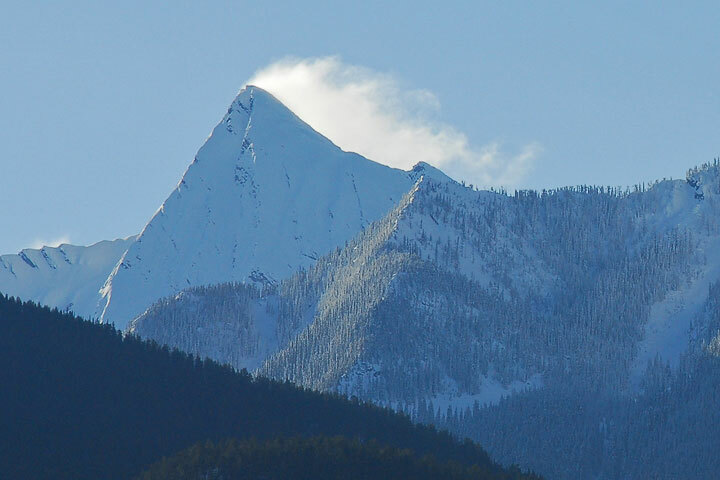 This motion drags air from the valley depths resulting in the cloud that appears to be streaming from the mountain.